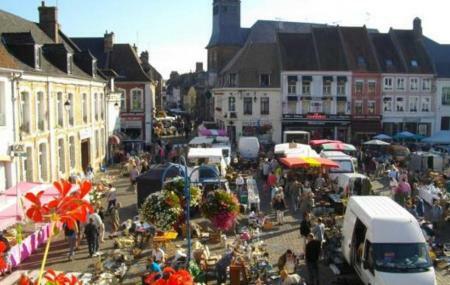 Find hotel near Place D'armes And Place C ..
Away from the modern supermarkets and trendy shopping malls lie a couple of simple, old fashioned, open air markets namely Place d'Armes & Place Creveceur. These traditional markets still retain their authentic French flavour and sell wide range of stuffs such as homemade cheese, jams, cakes, seasonal fruits & vegetables. You can also purchase delicious sausages, smoked garlic which is a local speciality and much more delicacies. An ideal place to rub shoulders with the locals and exercise your bargaining skills. Best to shop early as the markets close by noon. Town hall is at a stone’s throw. How popular is Place D'armes And Place Creveceur? People normally club together Philippe Olivier Or Fromagerie Marc Facchinetti and Calais Lace Museum while planning their visit to Place D'armes And Place Creveceur.